This VacuCobra vacuum lifter has a silicone suction foot and quick coupling suitable for the food industry with though sanitary requirements. 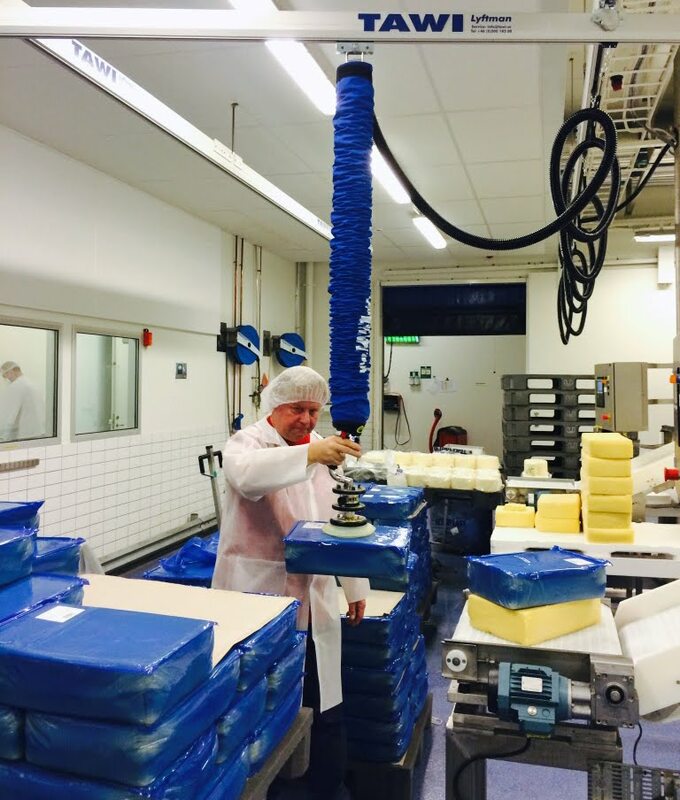 The VacuCobra is installed on a Lyftman aluminium crane system and is used by a Swedish food company for handling 10 kg cheese blocks. Before the investment the staff had complained about back and shoulder strains from heavy manual lifting. With our lifting equipment this potentially harmful manual handling can be avoided and an ergonomic way of lifting can be achieved. 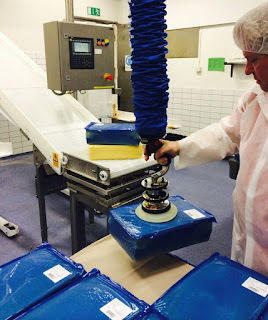 The company has also invested in two additional TAWI lifts to handle heavier cheese blocks weighing up to 25 kg. Good ergonomics doesn't just reduce the number of health problems, it can also increase productivity and contribute to lower costs for the company. At TAWI ergonomics is in focus when we develop new solutions for our customers and we manufacture products specifically designed to reduce the strain on backs, knees and shoulders. Read more about ergonomics at the Swedish Work Environment Authority website.